Cord, CD-318. Extension cord used with the T-30 throatmicrophone. 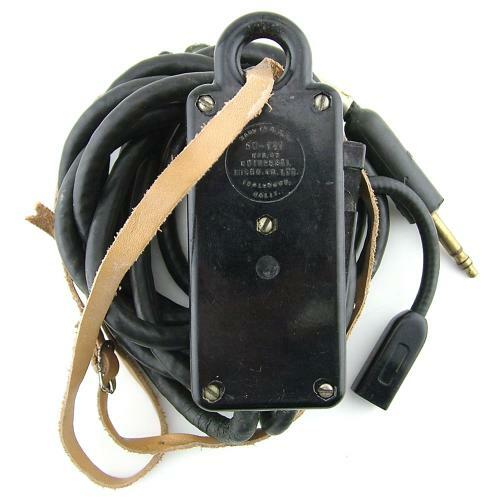 The microphone plug was inserted into the jack of the extension cord (JK-48). The cord has an inline 'push to talk' switch, SW141-V, and a black PL-68 'type' jackplug for connecting with the aircraft intercom. An adjustable leather strap was used to hang the extension cable around the airman's neck. Some damage to the rubber loom sheathing near the plug and switchbox but generally in very good used condition. Stock code H21614.